Have you watch “Death Note“, the famous a Japanese manga and anime. 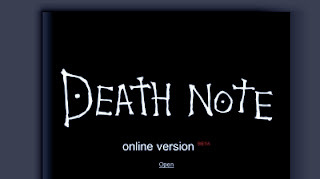 I was watching the move 'Death Note' before..I think that this story is good. The story about a Death God drops his book of death aka Death Note down to earth. The Death Note is then pickup by a smart student, KIRA and start off he journey to killings..then fights with a mystery guy, L..If someone’s name is written in the Death Note, he/she will eventually die accordingly.